LITTLE ROCK, Ark. – If Tommy Norton couldn’t bow hunt, he says he’d probably go crazy. It’s his solace, his sanctuary, his therapy. Making sure he’d be able to enjoy the upcoming deer season had him more than an hour from rural Hot Springs home on a Saturday afternoon at Archer’s Advantage. The largest shop of its kind in five states, Jerrell Dodson’s store is a bow hunters dream, with every accessory and walls of crossbows, compounds to recurves. Dodson estimates 10 percent of his business is traditional bows, and his answer to why some still choose to pursue deer with stick and string sums up all bow hunters. 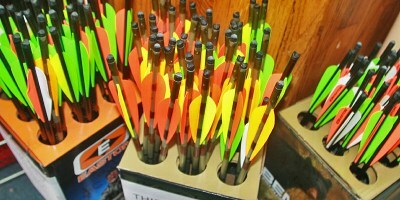 “A guy came in and said, ‘What in the blank would somebody want one of these for?’ ” Dodson said of recurves. “I pointed to a compound and said, ‘What in the world would somebody want in a compound when they can have a gun? ‘Oh.’ It’s just a harder way to do it, just to make it more challenging. That’s part of Norton’s philosophy. So he was in Archer’s Advantage picking the brain of bow expert Jody Morphew. The public school principal has a history with Morphew, growing up next door to him and his father’s archery shop. That time in the woods is precious, just like his constant scouting and hanging tree stands. Norton is making certain he will be able hunt at every opportunity he has. Although he’s already got a good set that he’s been practicing with every day, shooting different distances and angles at 3D targets, Norton was wanting a second in case of some unforeseen tragedy. Morphew said fitting Norton, a long draw shooter, and his huge wingspan takes special consideration, and he’ll probably decide between the Matthews Monster and the Bowtech Experience. The big man needs a draw of at least 31 inches, and most top out at 30. He wasn’t blinking at the $850 pricetag, knowing he’ll be getting state of the art. Norton said today’s bows are a far cry from what he started with. A state-of-the-art bow he shot 20 years probably wouldn’t be good enough for today’s bargain basement sales, he said. Accessories were next on the list. He likes the release he has, but Norton was looking to spend almost half as much as the bow for top-notch accessories. He plans to put at least $350, $400 into quality components. “You get what you pay for,” Norton said. He admits it makes deer meat a lot more expensive than beef, but that’s not the prime reason he bow hunts. Or why his 16-year-old boy and 10-year-old daughter are following his footsteps. Click image to view photos from Archer’s Advantage.